Color LED equivelent – No hassle with connection. CNC carry replacement stock of this Mazak Monitor. Fitted on M2, T2 controls. 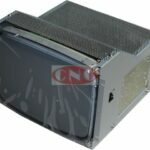 CNC 54 Replacement C-5470 monitors originally crt monitors are available brand new from CNC. We have been building these monitors for the last 12 years, and they are completely compatible and only made as a replacement for the original Mitsubishi C-5470 and work on the Mazak / Mazatrol / Mitsubishi machine tool systems. The OEM is a 14″ color crt screen, which our LED system based CNC 54 replaces. The C-5470 replacement monitor comes with a full 24 month / 2 year warranty. CNC 54 replaces C-5470 which was fitted on Mazatrol M2, M3, T2, T4 control systems with a industry leading 2 year warranty.